Over the recent holiday break I visited my parents about 3 hours drive away on the beautiful and isolated coast. I read my book in the hammock, ate delicious local delicacies of seafood, cheeses and wine, the weather was unusual with wonderful sun and then the moodiest grey stormy skies. 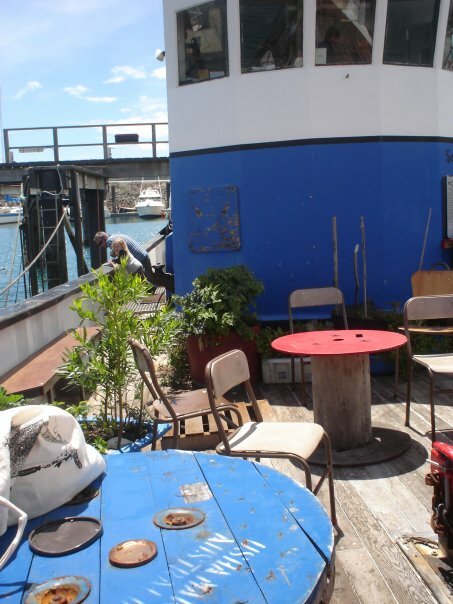 My father used to be a fisherman and he told me of a boat that I had visited about 6 months ago which he used to fish off and was originally Jacques Cousteau's first research vessel, 'Physalie', is now anchored about an hour away from my home and has been turned into a pirate cafe. Wonderful! That boat is so pretty! Looks like fun!